Summary: Before scientists found the cure, people thought love was a good thing. They didn’t understand that one love -the deliria- blooms in your blood, there is no escaping its hold. Things are different now. Scientists are able to eradicate love, and the governments demands that all citizens receive the cure upon turning eighteen. Lena Holway has always looked forward to the day when she’ll be cured. A life without love is a life without pain: safe, measured, predictable, and happy. My Thoughts: Honestly, I didn't think anything Oliver could write could outshine Before I Fall. I really loved Before I Fall. But I loved Delirium way more. When I first read the description I knew I had to read it. I am a hopeless romantic so the concept seemed so intriguing. I had to learn more about Oliver's world of no love. Would heartbreak end from love? Or would it just enforce more heartbreak? How can you truly be happy if love is out of the question? We are introduced to Lena who lives in a society where love (delirium nervosa) is frowned upon. At the age of 18, everyone undergoes a procedure to take away all emotions leading to love. Lena is 17 so her time is coming. She just wants to get it over with, she wants to be cured. It's all she has ever known and going against the government would result in dire consequences. But Lena agrees for the most part, she just wants to get it over with so she does not end up like her mother. We are introduced to all of the side characters. We meet Lena's family; the only family she has left after her mother, whom was claimed by delirium nervosa which led up to her death. We meet Lena's best friend Hanna. I really liked her best friend. She reminded me a lot of the girls I hung out with during my teens. The relationship between them was beautiful, they were there for each other like best friends should be. We are than introduced to Alex, who tells Lena he's already been cured so its safe to hang out with him. Of course Lena starts to have feelings for Alex. I loved Alex. At first glance, at first wink, I adored his character. He was sincere, sweet, and he was an all around good guy despite the rumors about those who were outsiders. The relationship between Alex and Lena was beautiful. Beautiful I tell you! Nothing could compare to the way they treated each other. When Lena is caught holding hands with another guy (the guy she is to be married to after the cure) instead of getting possessive Alex goes and tries to do a good thing for Lena. He was unselfish and thoughtful. Alex and Lena decide that they must take the next step to be together and even though it is very risky, they love each other so they know they can not exist in this society and must find a way out. I read Delirium right after Matched by Allie Condie and even though they were both set in a somewhat dystopian world, I liked Delirium more than Matched. Matched felt more dystopian while Delirium felt more worldly, even though the laws existed. I started Delirium and I didn't stop once even though it was 450ish pages. 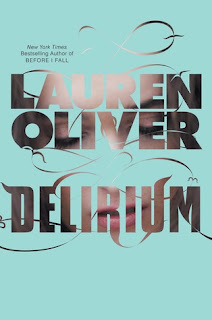 Delirium was marvelous and Oliver sure has an imagination! Be prepared to cry and have the tissues handy. Delirium is a epic love story full of emotion and how one choice (to be in love or not to be) could effect the rest of your life. Overall: Loved it! A must read for 2011. Get your wallets ready and rush out and buy this one right now! Cover: It's neat. It's somewhat plain but really neat. I just finished this today also. I thought is was amazing! It is officially one of my favorite books. Now I'm dying to read this. Great review!